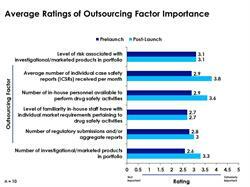 RESEARCH TRIANGLE PARK, NC--(Marketwired - August 23, 2016) - Among post-launch pharmacovigilance activities, the number of individual case safety reports (ICSRs) that a drug company receives each month is the most important factor when determining outsourcing needs, according to new industry study. On a scale from least important (zero) to most important (five), drug safety companies ranked the number of ICSRs received per month at 3.8, higher than any other outsourcing determinant among drug safety teams. Companies also reviewed other activities in terms of their importance when making outsourcing decisions. These activities included the number of in-house personnel available to perform drug safety activities and the number of regulatory submissions and/or aggregate reports. 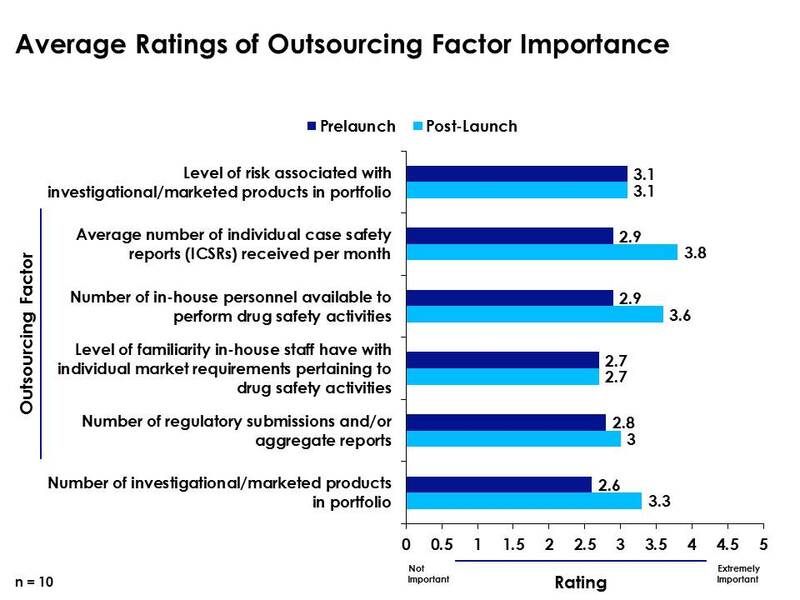 Prior to launch, however, the study found pharmaceutical companies' most important outsourcing factor is the level of risk associated with investigational/marketed products in portfolio. This remains consistently ranked at 3.1 for both the pre-launch and post-launch stages. The industry study, Pharmacovigilance: Balance Signal Detection and Case Management Responsibilities with Emerging Drug Safety Regulations (published by Cutting Edge Information), found also that the number of in-house drug safety personnel becomes more important when determining outsourcing decisions post-launch, increasing from a rank of 2.9 pre-launch to 3.6 after market authorization. The number of ICSRs usually grows after launch, raising the number of FTEs needed to handle these cases. Drug safety teams may need to consider their available in-house staffing more closely when discussing outsourcing options post-launch. Similar reasoning could also explain why the number of products in the team's portfolio also increases in importance from pre-launch to post-launch stages. A team may prioritize an investigational product's pharmacovigilance activities as the company works to create the product's value proposition. However, once the product is approved, the number of existing marked products may increase and so will the amount of total drug safety work. "Understanding these different factors and how they influence pharmacovigilance outsourcing practices can help teams make decisions regarding vendors," said Sarah Ray, senior research analyst at Cutting Edge Information. "Outsourcing discussions will change depending on whether a team is working on an investigational or marketed product." For more information about Cutting Edge Information and its drug safety benchmarking data, visit www.cuttingedgeinfo.com.